He’s a big fan of heating pads rather than heat lamps. Dr. Xin says simply heating concrete floors is risky because they won’t retain heat as well and can harbour Coccidiosis bacteria. Pig heating pads provide a solid surface. Rubber mats are required under a heat lamp. Most farmers add a drying agent to the solid surface where the heat is, and some will add a creep feeder later on. Another major benefit of a heat mat is the shape that maintains a larger, more spread-out heat source in the creep area, Dr. Xin says. 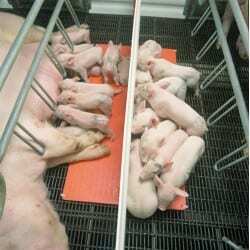 For litters of more than12 pigs, a five foot mat will provide the recommended 0.33 square feet per piglet. For wean-to-finish setups, Dr. Xin of Iowa State recommends 0.5 square feet per pig. Heat lamps cannot accomplish these recommendations. In order to provide more intense heat, lamps must be lowered closer to the floor surface which reduces the area heated. A single electrical outlet will serve two stalls with heat mats compared with one plug per heat lamp. Maintaining an extra, unused outlet in the stall allows for the use of heat lamps for first-day care. Centering the pig heating pads in the creep area keeps the piglets near the teat they’re nursing from, thus encouraging increased lactation. By also keeping the sow cooler, she is encouraged to eat more and be more comfortable, Dr. Xin says. Sows that are too warm will fidget and move around to find a cooler place to lie down and that results in more piglets being crushed. Pig heating pads can be cleaned while in-place in the farrowing stall. They are fastened at each corner and meant to be a fixture in the stall. Scours and rotavirus concerns can be minimized by cleaning along the edges of the pads. A heat mat has years of useful life, unlike heat lamps which can sometimes last for just days. Heat mats are only a receiver of information on how warm they should operate. For example, Osborne’s Stanfield® Heat Pads operate 30 degrees above room temperature. A controller that provides the desired temperature is recommended. By using controllers, heat can scaled down as animals grow, thus extending even greater energy savings. The payback for a system of the heat mat and controller is routinely within 14 months on systems using 21-day farrowing cycles, Dr. Xin says. The electrical savings per year with four-foot mats compared with 125-watt bulbs averages $56 per year per stall. The biggest advantage of pig heating pads, however, is in the pre-wean mortality reduction. Several tests have been conducted and validate a 0.5 pig per litter increase with mats due to diminished crush loss.